For the 3rd and final round on the 4th of July, Scott Rohrer started the day with a solid lead. 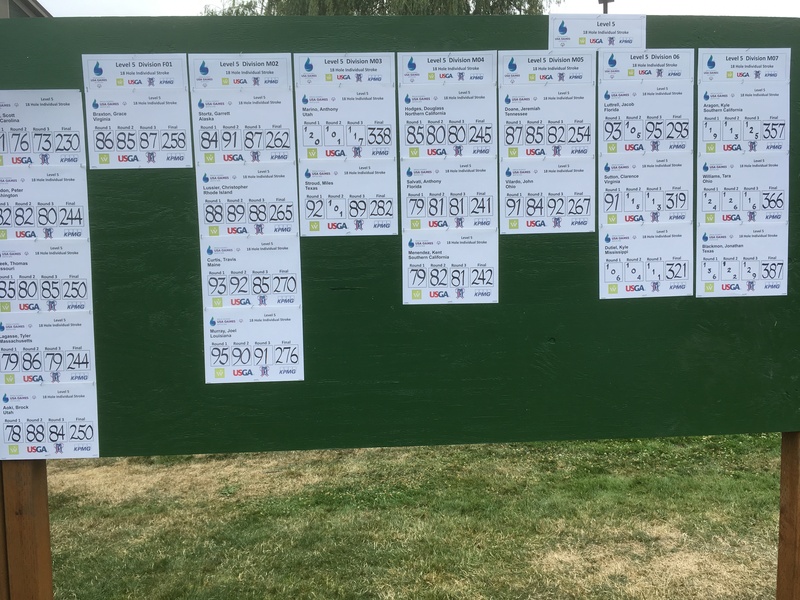 His playing partners for the day, Peter Condon of Washington was 7 strokes back and Thomas Cleek of Missouri was 8 strokes back. Tyler Lagasse was also 8 strokes back and started on hole 2, just 1 hole in front of Scott in the shotgun start. All the golfers were strong off the tee from the beginning and early on it was Scott’s strength as it had been for most of the 3-day tournament. The greens seemed to be playing even tougher on this final day as it had been mostly dry and sunny on day 2 and it was a very clear and sunny day right from the start of the day 3. It showed, as Scott and his partners struggled with putting on the 1st green and it continued for Scott for the first 8 holes. 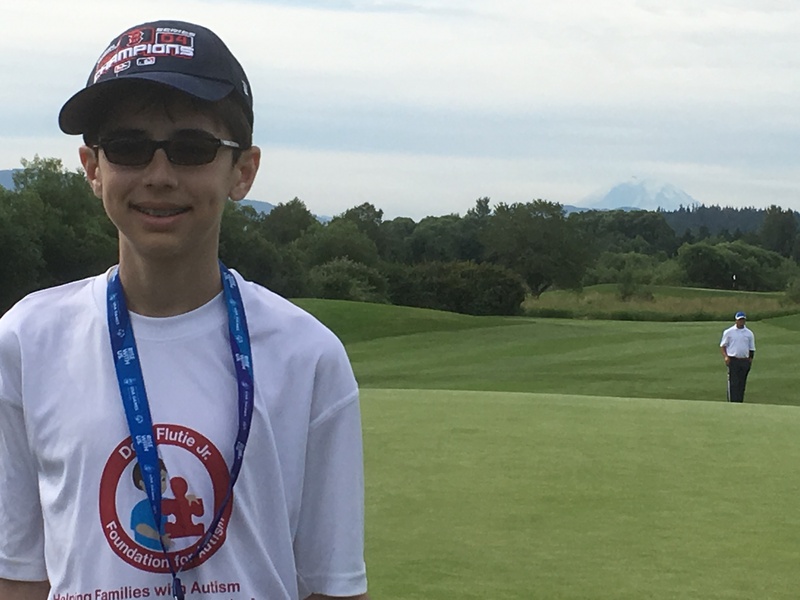 It showed in his scores as he started double bogey, bogey, bogey on the first 3 holes and was 5 over as he waited to tee off on the Par 3 9th hole with Tyler putting for birdie on the green of the same hole. Tyler came out on fire, playing aggressive and with confidence and was even par through his first 7 holes with a birdie on 4 to offset his bogey on 2, his first hole of the day. Since the tee box was moved closer on the 8th hole to make it a par 3 hole for the tournament, holes 7, 8, and 9 were all par 3’s so Scott’s group had caught up to Tyler’s and Scott was waiting for them on the 9th tee box as Tyler sunk his birdie, making him one under. At this point in the round, Scott knew he was not playing his best and seeing Tyler’s birdie probably got his competitive juices flowing, especially after he had just bogeyed hole 8. Scott then hit his tee shot on the 9th green landing his ball about 5 feet away from the hole. Scott let himself know and everybody in the crowd know that he was still fighting for gold as he fist pumped and yelled “boom” as he did on all of his big successful putts in this tournament. That was the start of a tournament clinching stretch of holes from 9 through 16. On the 10th hole, Scott pitched in for eagle from deep rough over the high mound of the back of the green. Scott was so far away from the hole that we could only capture the ball popping up in the air and rolling into the hole as you heard Scott and then the crowd, roar. At that point it was clear it was going to be Scott’s day to win Gold for the 3rd straight Special Olympics USA Games. After the very exciting and momentum changing 9th and 10th holes, Scott had only 2 bogeys for the rest of the day. He finished the last 4 holes with birdies on 15 and 16. 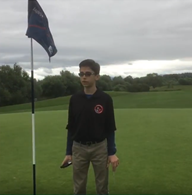 As he approached his putt on 18, he walked with confidence knowing he had the lead on his two playing partners for the day and that his par putt on 18 was likely for the win. I watched Scott beam with pride as he spoke to Jen Lada of ESPN first. He wanted to give me the first interview but I was happy to wait, watch, and learn as Jen with her producer Josh Vorensky and the ESPN camera crew conducted their interview for the station’s Special Olympic coverage. Jen pointed Scott in my direction after her interview was finished and he was happy to speak to me. 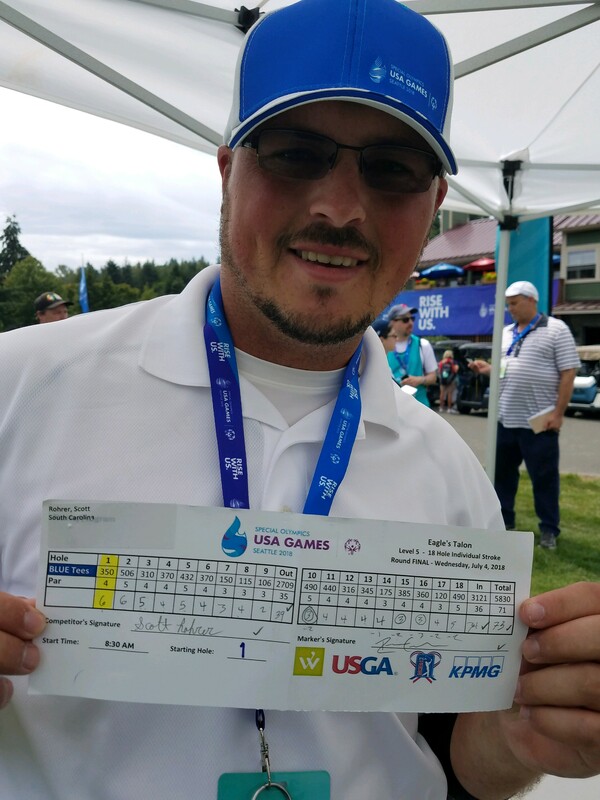 Tyler Lagasse had won silver for the 3rd straight Special Olympic USA games, 6 strokes behind his friend and first round partner Scott Rohrer. Scott’s finish was too strong for Tyler to catch up. Tyler was still all smiles because he loves the game and he gave it his best effort to go for Gold. I met with him after his round was over. I had an unbelievable week with Scott and Tyler. Without them and the Doug Flutie Jr Foundation for Autism who sponsored all 3 of us, none of the experiences I had would have been possible. I started my journey in Seattle with a tour of Eagle’s Talon where Tyler and Scott would battle it out with the other Olympians for 3 straight days. My tour included the Hole 3 green known for its beautiful view of Mount Rainier. It was too overcast to see the mountain that first day but over the next several days while following the games, the sky cleared up and Mount Rainier slowly came into view. Pictured Above: Me at Hole 3 of Eagles Talon during my Day 1 tour. It was overcast, so I could not see Mount Rainier. My week kind of went the same way as I came into the week unclear on what I would do and how it would come together. But in the end, each day I grew as a reporter and as a person looking up to Tyler and Scott as I learned of their stories and how they have achieved so much by working so hard. Over the week I had time with Deborah Horne of KIRO 7 news who put my dad and I on the air. I got to cheer the athletes at Husky Stadium for an unbelievable Opening Ceremony. 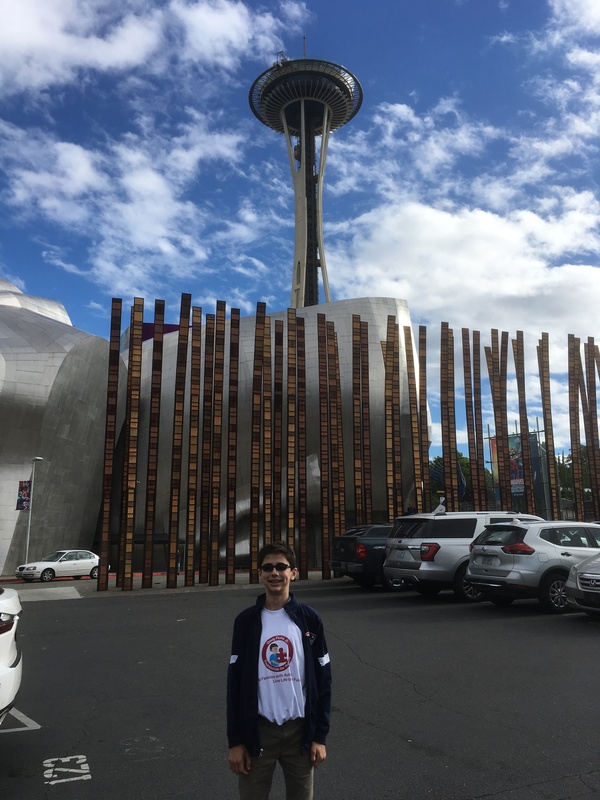 That same day, I had the chance to visit the Space Needle in Seattle Center. On my last day I met and interviewed with Podcaster Colin Weston of ModGolf. I also even learned a few tips directly from Jen Lada of ESPN. But this trip was about all the inspirational athletes I saw at the Opening Ceremonies and especially about Tyler and Scott because they were why I was in Seattle. To me it was fitting that on the last day as Scott and I reached the 3rd hole for the last time that Mount Rainier was visible for the first time all week. 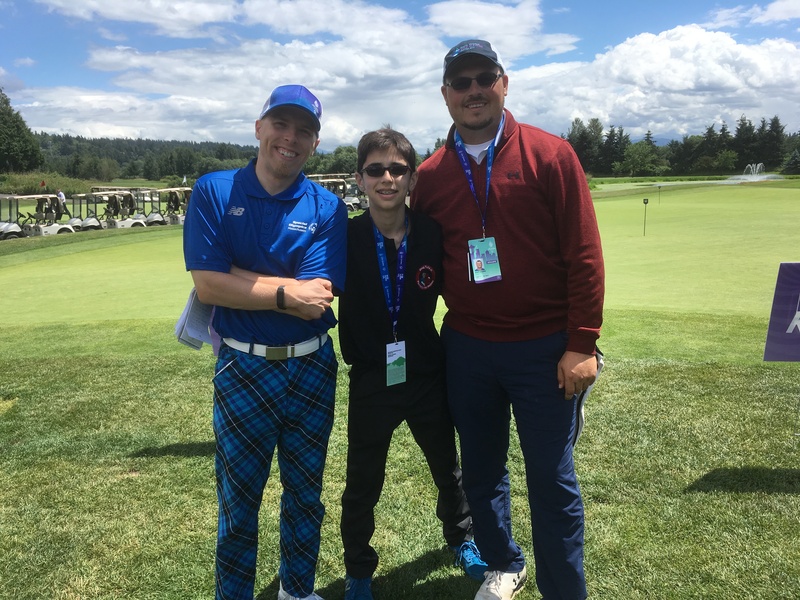 These golfers had reached yet another summit and I got to share the experience with them. They have inspired me and many others to keep pushing to be the best you can be. Behind the scenes, this trip was not easy for me and at times I got very frustrated when things did not go as I expected. However, just like for Tyler and Scott on the golf course, I was able to find focus on camera. Now I know I have to keep working to improve my skills to be the best me I can be. With this life changing opportunity to be a Flutie Fellow covering such an exciting national event and travel to Seattle for the first time, I am one step closer to reaching my goal to become a Professional Sports Broadcaster. Note: Divisions M01-M03 are High Performance (Blue Tees), the rest of the golfers (M04-M07) teed off from the White Tees.